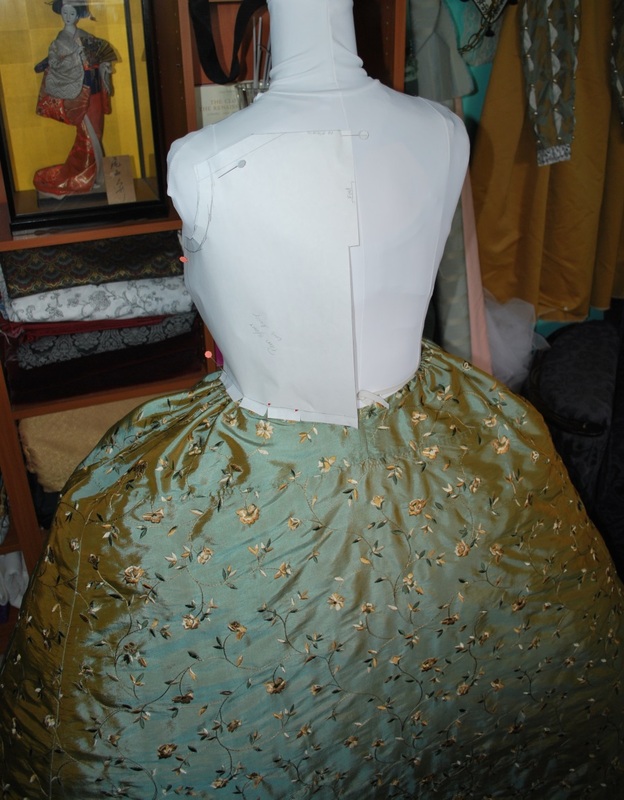 To see how I made the underskirt, click here for the LiveJournal write-up, or here for the dress diary. 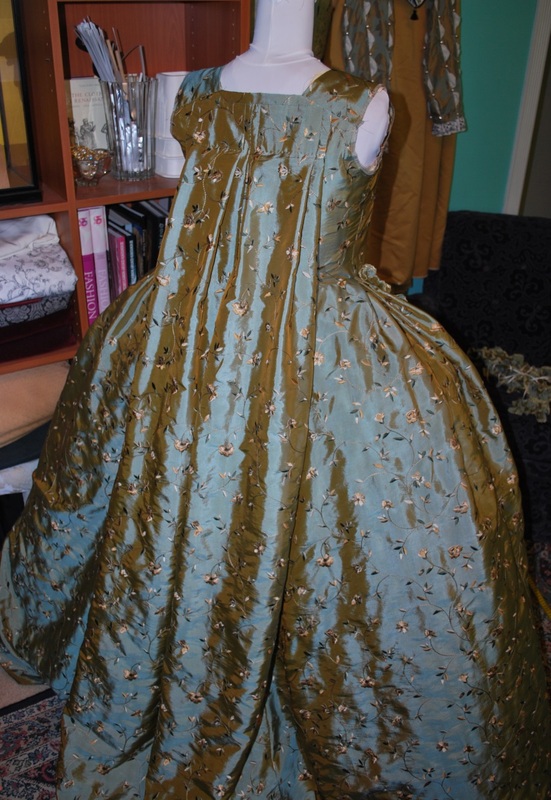 This main gown write-up is going to be fairly sparse, life got really complicated in the middle of making this, so I really didn’t take any time to photo anything– it was all Sew! Sew! Go! Go! And even then it took me way too long to complete– my appologies, Pam! 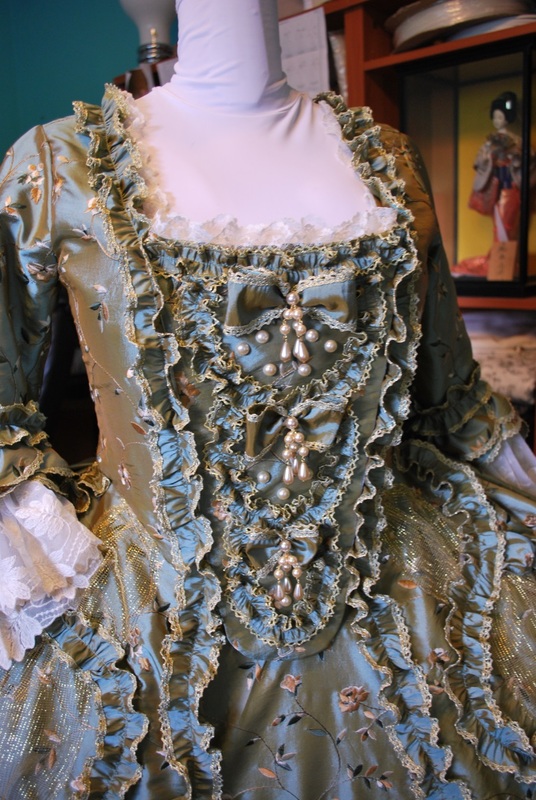 Hopefully the blue toile pockets and the pretty pearl chandelier earrings I sent along with the gown will make up for my tardiness! 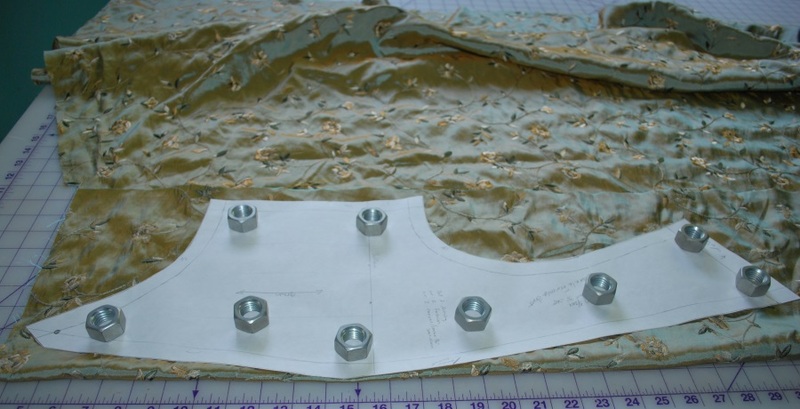 To begin the main gown, I had to draft a new bodice pattern, which is always a stressful chore. I worry about fit every moment! 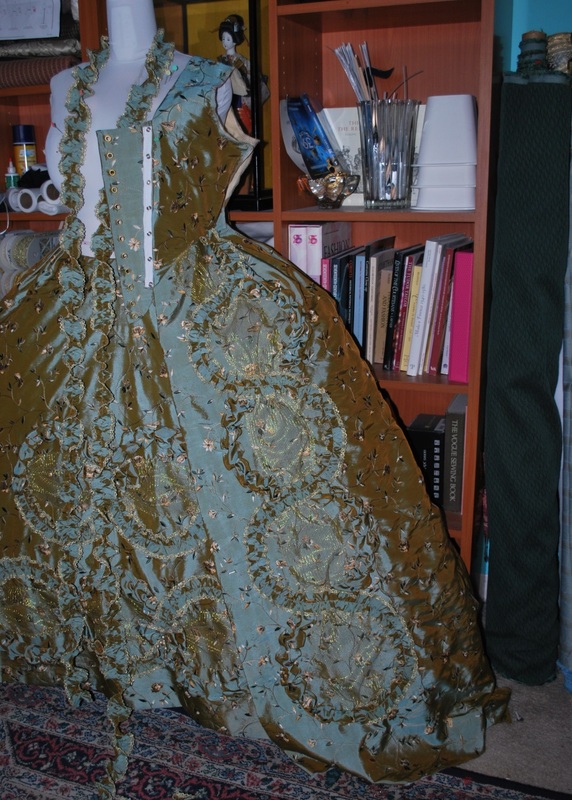 It is a boned bodice, so there is no need for any stays with the gown. It’s a theatrical style build, so she can easily dress herself. 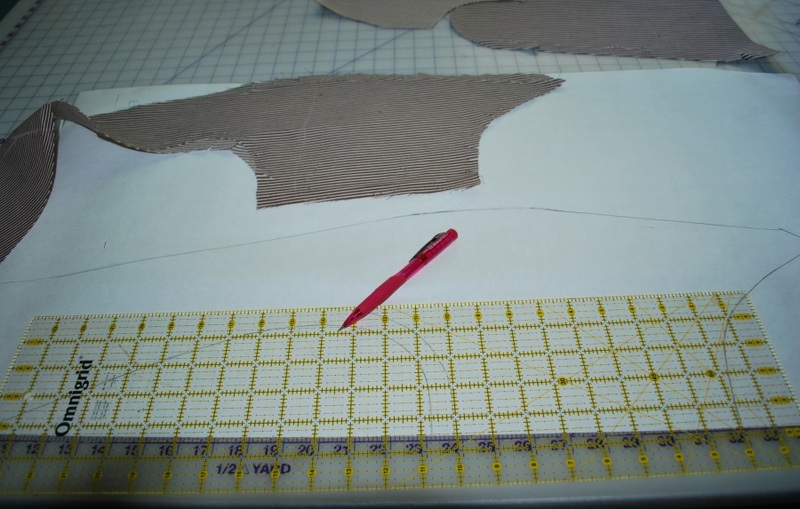 I start with paper, and then when I think that is okay, I move on to a mock up fabric, and when I think that is okay I trace it out to paper again for the formal pattern. Then, it’s finally time to cut out the fancy fabric. all the layers cut out and ready for assembly. 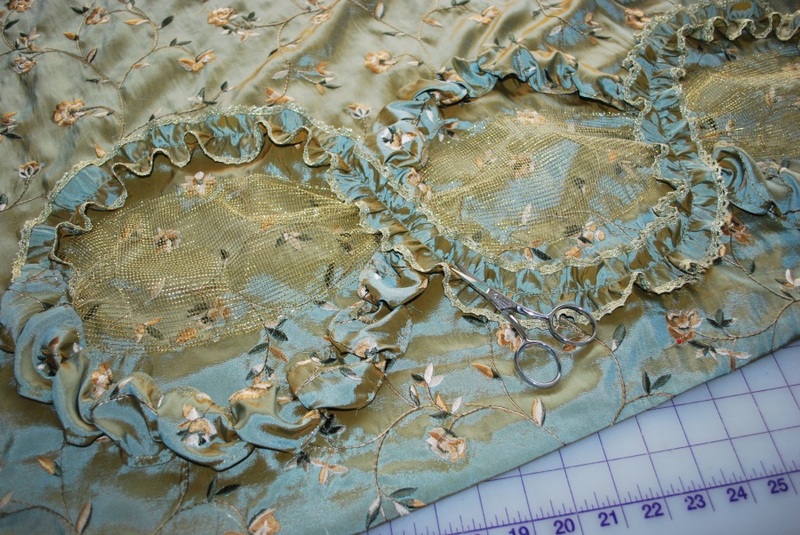 The bodice fronts fully assembled, checking the drape of the skirt fronts before attaching them to the bodice. Marking off where the ruched furbelows will be placed. After adding the strips of gold netting. Snippety snip snip– never ending snipping of thread tails. There were thousands of them by the time I was done! 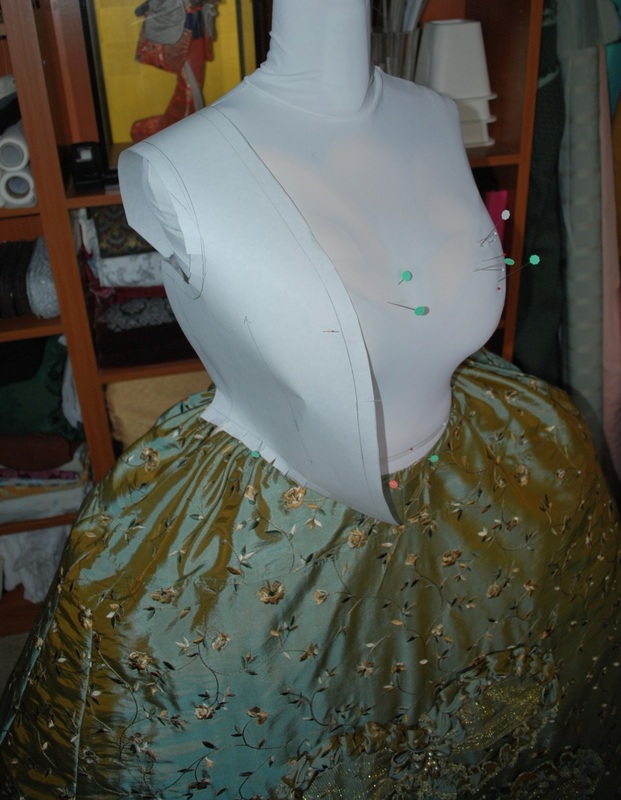 Skirts attatched, front sewn to back at the sides and shoudlers. The side pleats didn’t give me a lick of trouble. They ususaly do, so I wondered why it was so easy this time… and I came to realise that the side seam was cut on the straight grain, not the bias. This also made another nice thing happen to the front edge of the skirt— no warping! 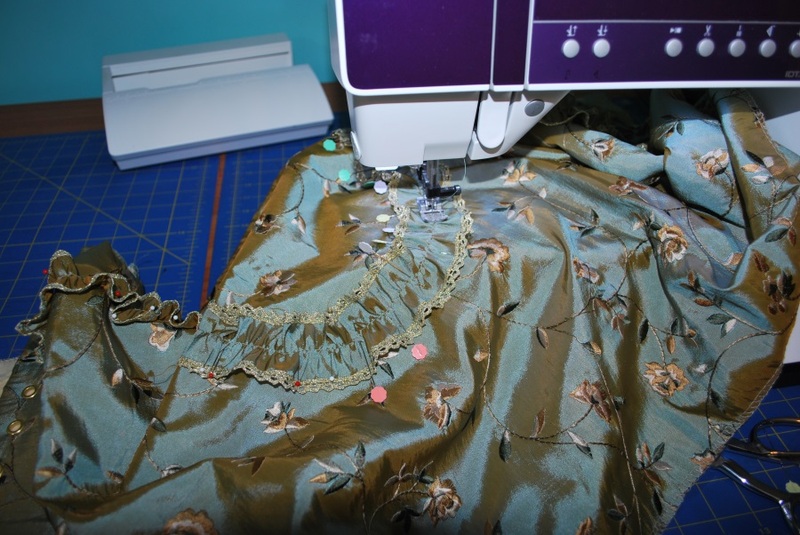 When the skirts are cut the other way– bias at the side and straight at the front, the side pleats give me headaches and the front edge warps. MUST REMEMBER FOR NEXT TIME! Those front edges lay nice and flat, and it’s lovely. Sleeves attached, and more ruffly furbelows attached along all the front edges. It’s really REALLY busy looking. I love it! 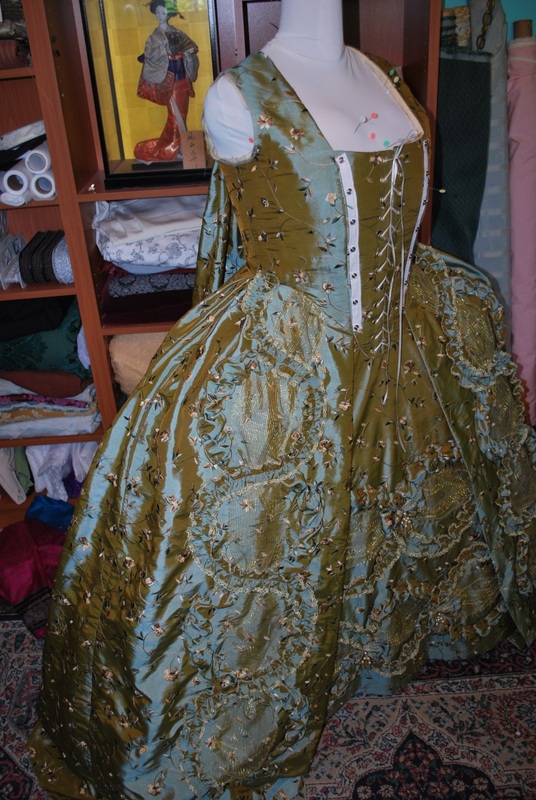 The stomacher– I totally ran out of the thin gold lace, and had to sub another in its place… still looks damn fine, if I do say so myself! 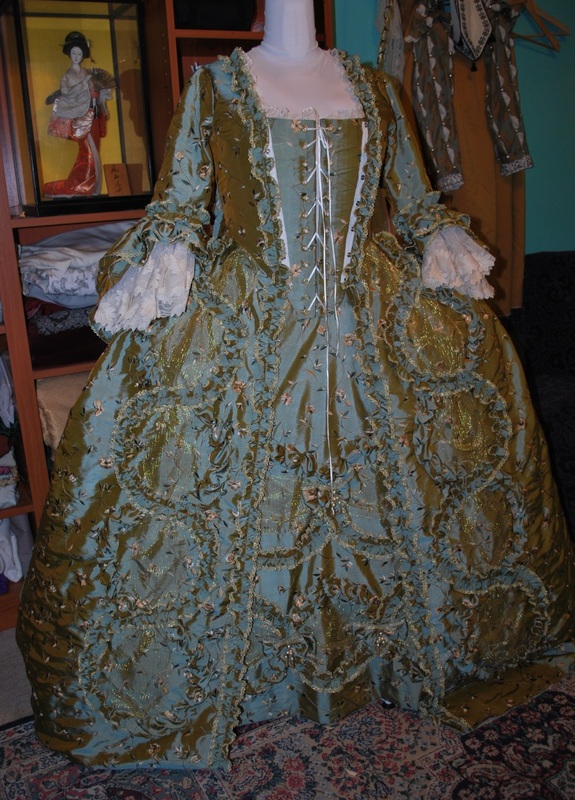 I didn’t take any photos of the sleeves or the stomacher being made– real life was moving too fast to sync with blog life! I’ve just discovered your website. Love it! 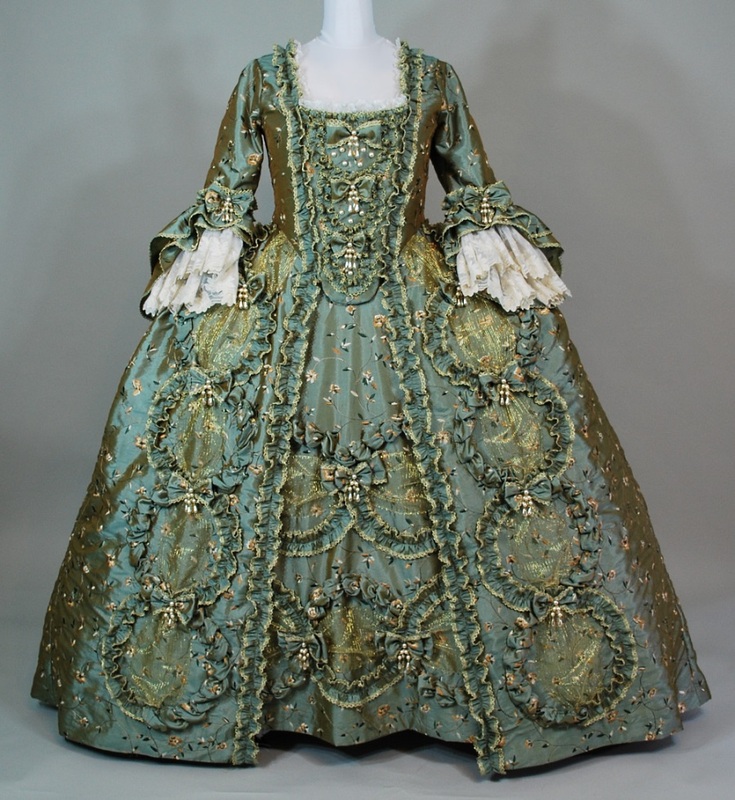 What pattern is this gown based on; or do you just drape everything? Thank you, Shannon! 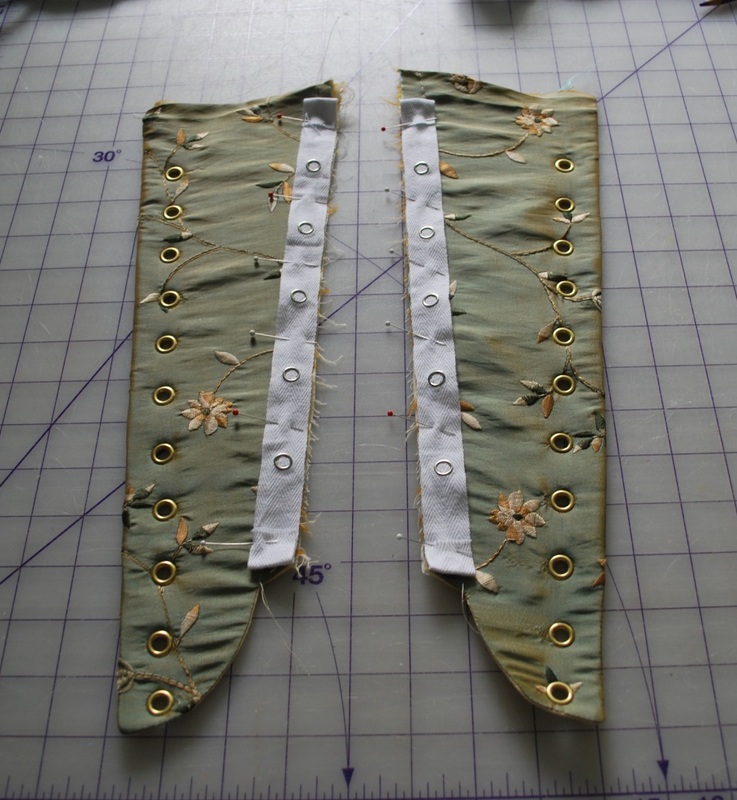 I drafted the pattern myself, but it is partially draped, too. 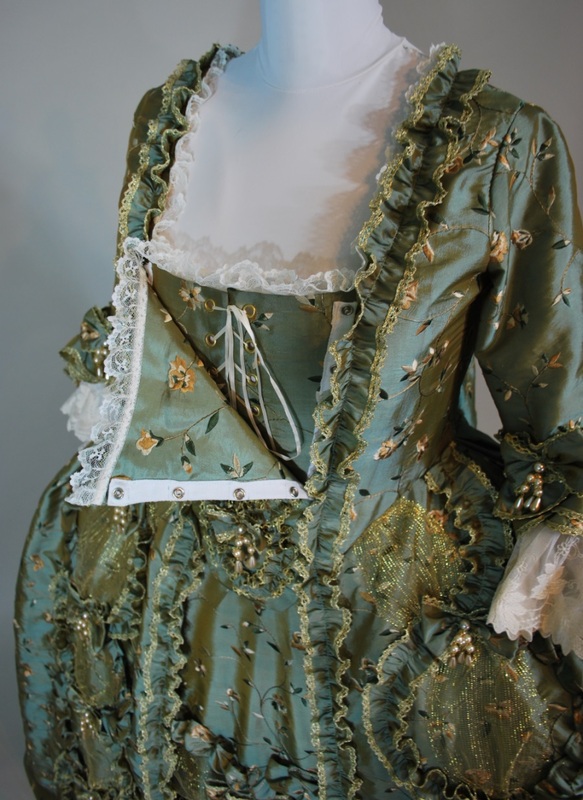 Hi, I was wondering if it would he possible to get you to make a pattern for me so that I could make my own Robe a la Francaise. And how much that would be. 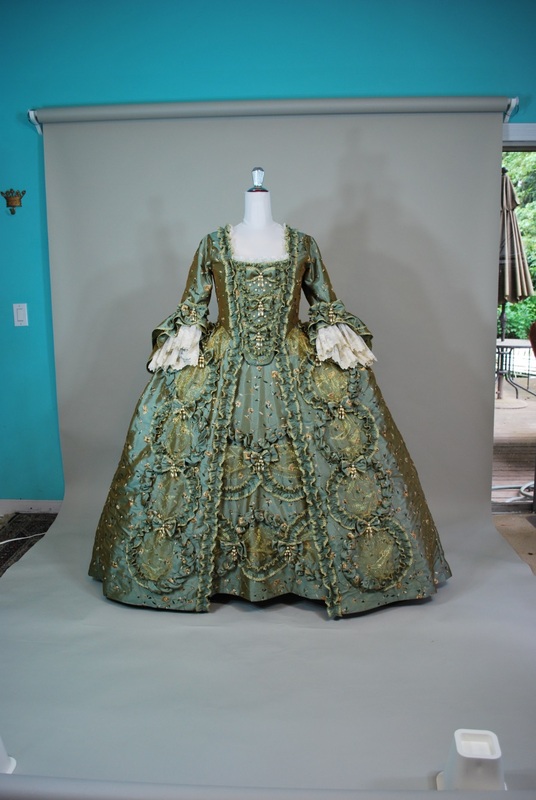 Also how much it would cost for you to make me a robe a la Francaise. I very much hope you receive my message and can get back to me. Thank you for thinking of me! Unfortunately, I do not make patterns to sell, and I am currently not accepting any custom orders. I’m sorry! There are many lovely Robe a la Francaise patterns out there, JP Ryan and Wingeo come to mind. Good luck! Awe that bums me out I wanted to surprise my wife with a new gown! 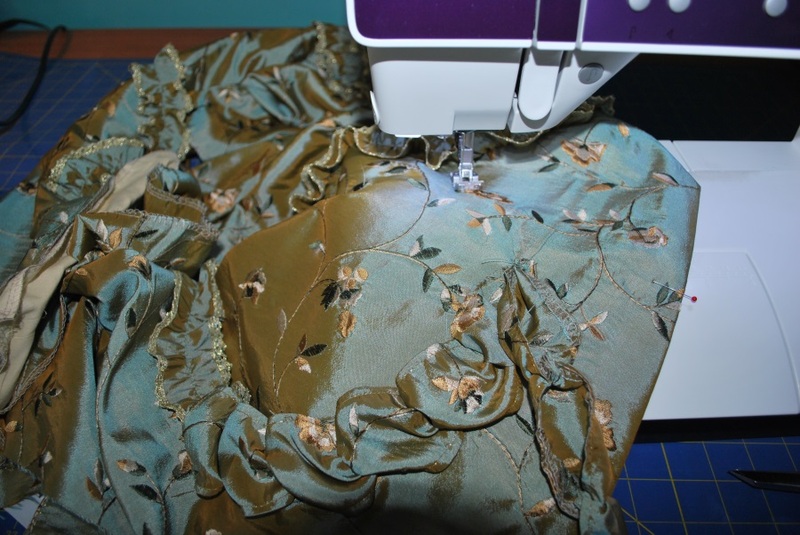 Do you know anyone else that makes Robe a La Francaise gowns? I’m sorry, I don’t! If you can provide a pattern, I’m sure a local-to-you seamstress who specializes in wedding gowns might take on the job. They are complicated to make and a real labor of love! 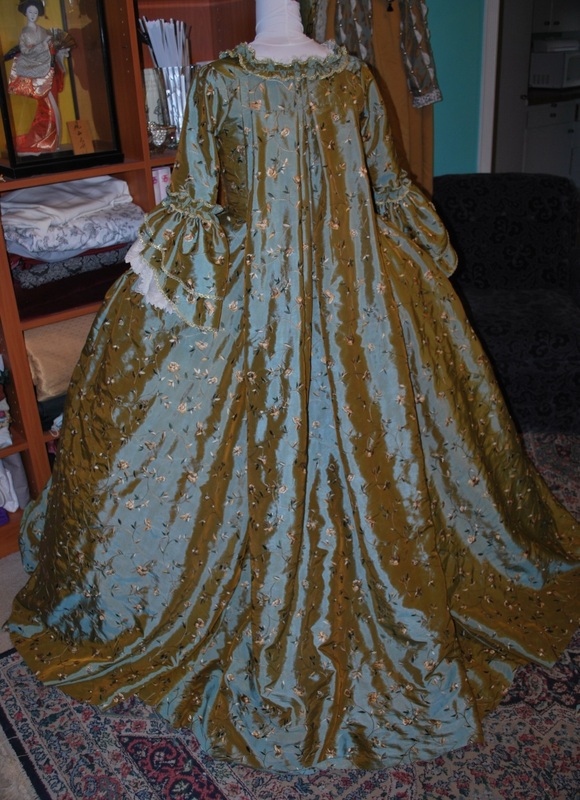 Are you accepting any new custom orders for Robe A La Francaise gowns? Hello Alcina! Unfortunately, at this time I am unable to take any custom orders. I appreciate you thinking of me! Hi! I really admire your work! All your dresses are master pieces!!! I have only one question for you: how did you do to adapt your clothing model? It´s fantastic! Hi! Thank you so much! 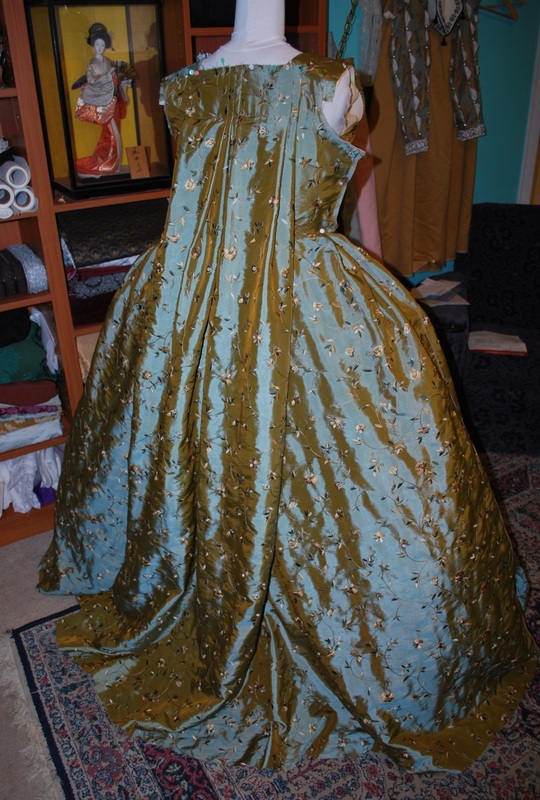 My dress form is wrapped with different pieces from “Fabulous Fit” to approximate the figure of the lady I made the gown for. Highly recommended! It’s been a while, according to the comments, since anyone asked about a custom order. I was wondering if you are taking any on at this point. I would want a rather simply made up Robe a la Francaise. 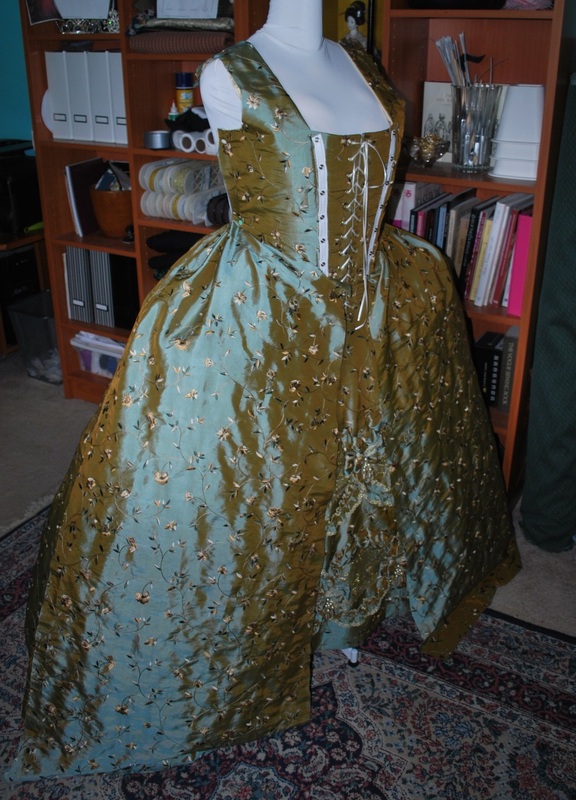 Black taffeta, with some rocaille ruching and a black satin ribbon “line of Bows” stomacher. Please let me Know if you are accepting any new commissions. Hello! Thank you so much for your message! Unfortunately, I am not taking any commissions at this time. Best of luck, I hope you find someone who can make you what you want!